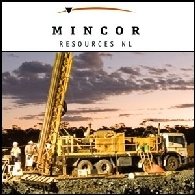 Mincor Resources NL is a nickel mining company which operates two mining centres in the world-class Kambalda Nickel District of Western Australia, and has been mining there successfully since 2001. The Company is also active in nickel and base metal exploration throughout Australia. Mincor's growth strategy is aimed at the creation of a diversified mining house through a strong focus on growing the Company's successful nickel business while simultaneously expanding its interests across a wider range of mineral commodities.